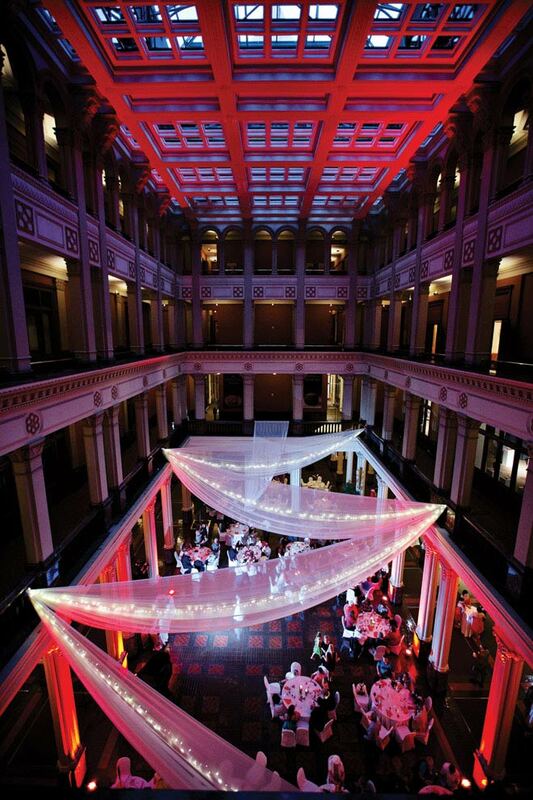 From monograms to color schemes, lighting creates an overall atmosphere for your big day. Nothing can set the right mood quite like lighting. With the ability to transform the entire ambiance of your wedding, lighting is the unsung hero of event details. That’s why more and more couples are turning to lighting professionals to help them take their wedding to the next level. Lighting a wedding involves more than just switching on the fluorescents or adding a few candles. The options are nearly endless and can get downright technical, but here’s a peek into the basics. Uplighting is one of the most popular lighting techniques. This little-goes-a-long-way method involves placing clear or colored lights around the perimeter of the room, each of which projects columns of light toward the ceiling. Not only can this give the room a boost of brightness and color, it also showcases your venue’s architectural highlights. Color washes are another effective lighting technique. This option saturates the room with colorful light, transforming the mood of your space. Looking to get your name in lights? Gobos are circular stencils that cover light fixtures, projecting a design or pattern onto the wall or floor. Monograms, wedding dates and personal motifs are all popular designs for wedding-day gobos. Pin spots are focused beams of white light that are angled to shine directly on an object, highlighting details like centerpieces, the head table or cake table. Pin spots become especially handy once you dim the lights to start your dance, as you can still show off those special details. Lastly, there are those lighting pieces that do double-duty, not only illuminating the space but also enhancing your décor. Think chandeliers, strings of café lights and lanterns, all of which can be rented from local event companies. And, of course, there’s candlelight, that ever-popular romantic touch. Now that you know some of the industry lingo, who can help you make your vision come to life? Start off by taking another walk-through of your venue with the site’s event coordinator; they can provide great insight about what they’ve seen done in the space. Chat with your photographer and videographer as well, as they may have advice about what looks great in photos and videos. If you’re working with a wedding planner, they’re sure to have many suggestions about how to personalize the space. DJ companies are usually your best bet when it comes to selecting and executing your lighting plan. Most offer customizable lighting packages and have plenty of experience with event lighting. Rental companies are also great resources. When it comes to lighting, you get what you pay for. If you’re budget-conscious, keep in mind what’s realistic but will still add something special to your day. Chances are, lighting wasn’t the first item on your ever-growing list of wedding wants, but it’s one that can complement all of the decisions you’ve made thus far. Lighting styles for every kind of wedding. • Classic Monochromatic lighting in tones like amber, champagne, soft pink, whites and pale yellows enhance that timeless, romantic look. Pin spots on the centerpieces and uplighting draw attention to ornate details. • Eclectic Get creative with hanging fixtures, such as unique chandeliers or clusters of colored lanterns. Change it up throughout the night; use warm washes of color for the cocktail hour for a relaxed mood and switch to cooler, bold colors to boost the energy on the dance floor. • Modern Take advantage of intelligent lighting or gobos to create unique, personalized patterns and textures on floors or ceilings. For color washes, think bold and vibrant colors such as blues, purples and pinks. • Rustic Warm tones such as oranges, pinks, ambers and yellows complement barns and rustic venues, and do especially well with brick and wood detailing. If your venue is outdoors, ensure you have adequate power available, and know which lights can and cannot be used outside.